There are lots and lots of different potato varieties in the world. The flesh colour ranges from pale to yellow in the standard varieties. Various other colours exist, red, blue, purple. Depending on the starch content some are better for frying, baking, gratins, salad, mash, crisping, etc. 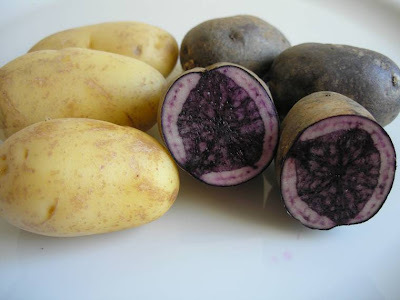 This nutritious tuber, the fourth largest food crop in the world has found a firm place in many cusines, including, I believe, all countries in Europe. I was intrigued to taste how the blue potatoes taste. One of the simple and tasty ways to cook potatoes is sautéing. Cooking in a pan with oil or lard, developing a brown crust outside. 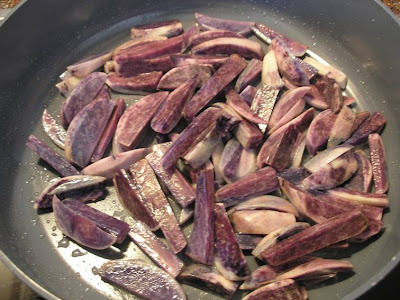 Peel the potatoes, cut into even slices or sticks. Heat the oil in the pan, use enough oil to coat the potatoes.The oil is hot when a piece of potato or onion starts to sizzle immediately when dropped on the pan. The pan should be big enough so the potatoes have enough room on the bottom to make a nice crust. Cook the potatoes for a 5 minutes without stirring around too much to let the crust build. Add some salt quite in the beginning of cooking. Stir occasionally to avoid burning at the bottom. 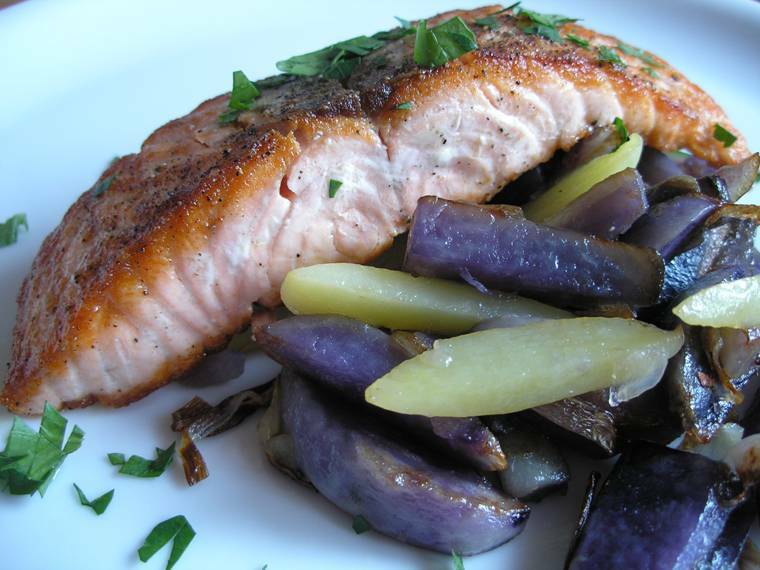 Serve immediately garnished with some parsley or dill as a stand alone or a side dish. When eaten as a stand alone dish, a few slices of fresh tomato with black pepper go nicely with it and add lightness to the meal.